Jaclyn had never put much thought into skydiving before. A creature of the land like the rest of us, it just hadn’t crossed her mind. 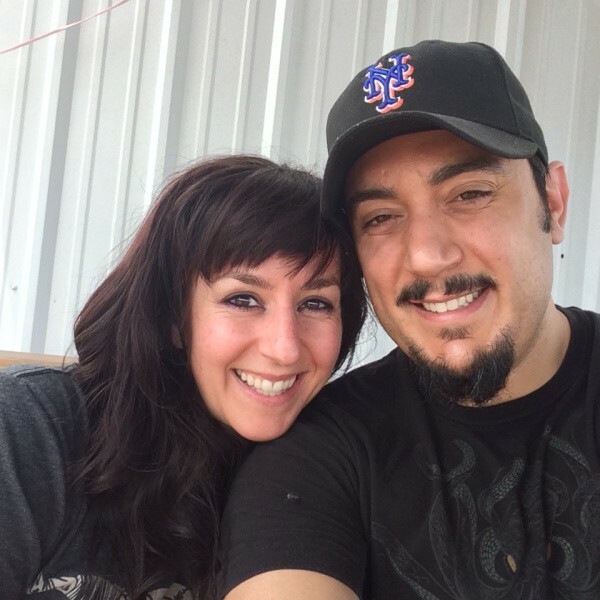 Until she met the best man at her best friend’s wedding who was a regular at the Triangle Skydiving Center. And, more importantly, until she decided this was the year she would open up. Go with the flow. See things from a different perspective. Watch her whole jump in the video! 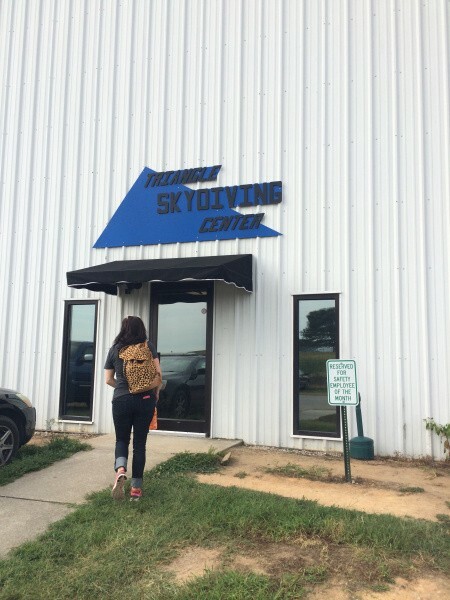 And, read more about what skydiving can mean for conquering fear, and her experience with Triangle Skydiving Center, in this interview. Why did you jump at the chance to go skydiving? I guess I should be more specific. These past few years, I have struggled to find my way in many aspects of my life and much of it felt like an uphill battle for quite some time. Shortly before New Years 2014, I noticed that a lot of that battle was due in part to a rigid attitude and a narrow perspective. My New Years resolution in 2015 was to just go with the flow and widen my perspective. When I did, things just started to fall into place, and I was able to see life through a wider lens. It opened me up to more experiences. And, the more I opened up, the more I wanted to experience. Now, I just live in the present and amazing opportunities that are coming at me left and right. 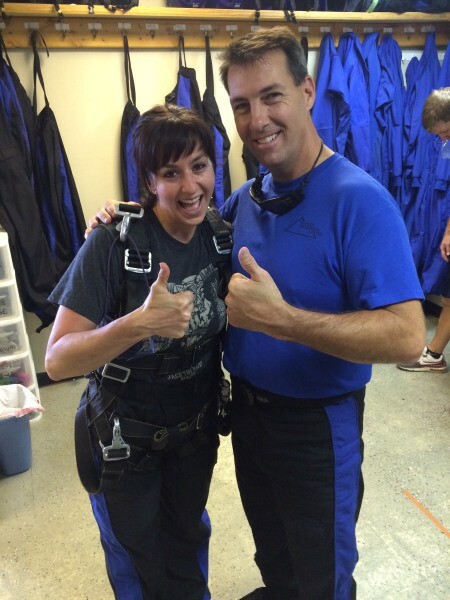 Late last year, I stated out loud to my husband’s family that I wanted to go skydiving before the end of 2015. I was specifically drawn to skydiving as a new experience because it would force me out of my comfort zone, and I would literally have see things from a different perspective. It would give me a sense of freedom that I had never felt before. It also seemed like a once in a lifetime experience that I could not pass up! So, no, I have never been skydiving before. Honestly, I never even put much thought into it before a few years ago when I was the matron of honor at my best friend’s wedding. The best man was an avid extreme sports enthusiast (and regularly jumps atTriangle Skydiving Center), and he was talking about how he was trained skydiving coach. I thought about how cool that sounded, but never thought too much about it after that until late last year. I thought it was absolutely fitting that I saw him right before my jump, as he just finished taking one of his best friends out in their first jump! Did you get nervous before the jump? Because this year is all about going with the flow and opening up my perspective, I have gotten in the habit of not sweating the small stuff. 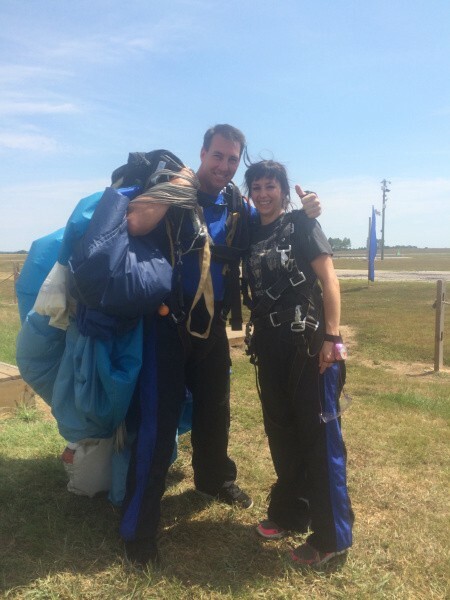 I knew that this would be a tandem jump, and I would have very little to be responsible for besides taking cues and going along for (an incredible) ride, so I didn’t think too much about it beforehand. Truly, I was not nervous until I was driving up to the facility. For some reason seeing the space and airplanes made me feel nervous. Then when I walked in the front door, I was immediately greeted by Julie, Ali, and ShawnaRae at the front desk. I think it was Julie who quickly found my reservation details and started walking me through the paperwork. She was so incredibly calm, serene, and professional that I felt like I was talking out a friend. I must have still been nervous when I started the paperwork because she had to tell me what date it was and made sure to mention that when you are nervous it is difficult to remember those details. Her recognition of my nerves seemed to calm me down. Also, after you fill out the paperwork (which is much easier than anything you have to deal with at the doctor’s office), you have to watch a brief video about Bill Booth, the guy who invented tandem jumping in the 80s. I was mesmerized by his incredible beard more than anything else! As I was wrapping up the video, my instructor Greg Upper introduced himself to me, and we got to chatting. He has such awesome energy, so I think if I had any more nerves left at they point they dissipated. He had so much excitement. After meeting him I was even more excited to jump!What did Greg, your tandem jumper, explain to you? Greg went over all the details of the jump, like how high we were going to fly, at what altitude we would jump out, the instructions for where I should place my hands at various points during the jump, where he would check the harnesses and when, and when we would be connected and when we would not. He asked multiple times if I had any questions, and I did not, as he explained more to me than I even thought to ask. How many other people were on the plane? There were 3–4 people from the camera crew, 4 sets of tandem jumpers, and the pilot. My instructor was Greg Upper, and he is co-owner of TSC. He had such an amazing energy, and we clicked right away, so I started asking him about his past and how he came to be an owner. He told me that he was a private investigator for 17 years before. And, he did his first jump on April 27, 2001 at 4:27pm. He is a precise person, which is a great quality to have in an instructor! He got his coach (instructor) certification in 2004 after he had done 150 jumps, and worked part-time forCarolina Sky Sports. On labor day weekend 2008, Carolina Sky Sports celebrated their 35th year anniversary and announced they had sold the business to a company that was only going to be working with the military. No civilian skydiving would be allowed. So, he decided to pursue opening his own Drop Zone at the Franklin County Airport just 4 miles away. He contacted Ronnie Goswick, who is in charge of economic development for Franklin County, who put him in touch with Rob Southerland, who was the new airport manager. Greg met with Rob on the Wednesday after Labor Day and discussed opening a Drop Zone at the airport. He signed a 5 year lease in December 2008 to begin operating in April 2009. As of a few days ago, Greg had completed 4015 jumps, of which 2868 were tandem jumps. He averages 8–10 jumps per day and 550 jumps per year. Tell us what tandem jumping is like. The tandem jump was incredible! Greg and I were strapped to each other, and I was in front of him. We were sitting on a bench seat, then we scooted out and exited the plane at 13,500 feet. I remember the feeling of the free fall. We were in it for approximately 55 seconds, and it wasn’t quite like falling. It was more like flying, I thought this was going to be my favorite part, but it ended up being my second favorite part. I remember when we immediately exited the plane, thinking, “Oh man, this doesn’t feel right.” I was scared for a second, then I remember thinking, “I want to look at the ground.” So, I repositioned myself to be belly down. All I could think was, “OMG, this is incredible, I feel like I am flying!” I was just looking at the ground. The actual free fall part is indescribable. Its not quite like a dream you have where you are flying, because you are literally falling, but it feels almost like flying. Then our parachute opened at 6,000 feet, which was actually my favorite part! This did feel like flying. I told Greg I was up for anything, so we did twists and turns and what he calls “Zero Gs”, which is achieved when you flare aggressively then let up on the toggles quickly, allowing the parachute to surge forward and down giving the effect of “Zero G”. This is something we only did above 1,000 ft. for safety. That part felt like the best rollercoaster ever! It was so much fun, and I couldn’t help but laugh with sheer happiness! If you could describe your jump in three words what would they be? Ohhh, great question! Inspirational. Freeing. And, (phenomenally) fun! How did you feel for the rest of the day? Were you different? I felt fantastic and was totally on a high from the experience! It was like doing something really liberating and absolutely exciting and being able to feel and revisit that experience over and over again. I felt like I was on a high for at least a few days after and I couldn’t stop smiling. Absolutely! I signed up before I left the jump and am recruiting friends to try it. I would love to find a date that works for all of us! I want to try and do a backflip when I am free falling! 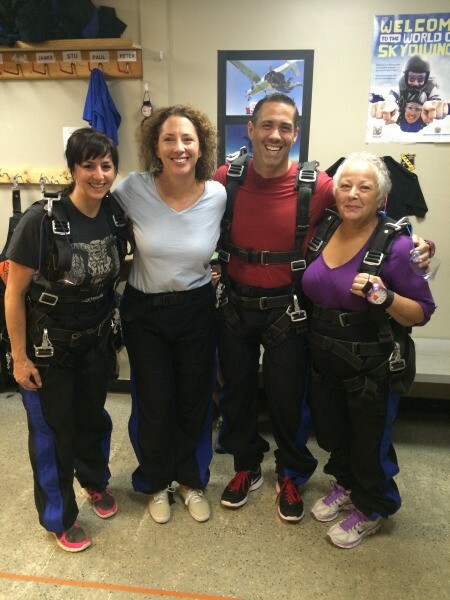 I jumped with a woman who was 74 years old, and her son. 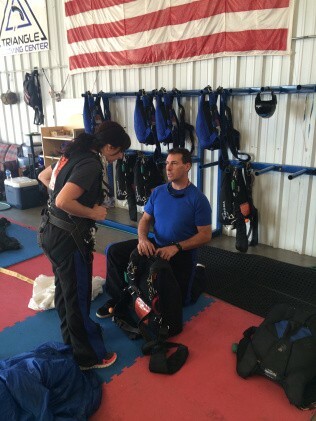 She jumped in memory of her husband who had just recently passed away and used to skydive with their son. She was so brave. I could tell she was so nervous but felt the need to do it for her husband. There was also a man who was 84 years old who regularly skydives at Triangle Skydiving Center. He and his wife had cancer about 10 years ago. But, he survived, and she didn’t. Once he was cleared of cancer completely, which was around his 80th birthday, he decided to skydive. After his first jump, he decided to do it every year and get sponsors to raise money for cancer research. He has done it four times now, and will do his 5th jump this November. He even has his own jump suit and sells patches to put on it (like Nascar) to raise money. These two people are so brave. And, their two different reasons for jumping are so telling. My takeaway from that is that we will all face difficulty and tragedy in our lives. Once you deal with it and come out on the other side, scary things seem a little more achievable, and overcoming them feels even better. In general, I think people naturally avoid being outside of their comfort zone until they are forced to live in that realm through difficulties or tragedies. Being outside your comfort zone is when you end up learning the most about yourself and what you want. If people take anything away from this story, I would want them to take this to heart: Don’t wait to do something that seems scary. That thing could end up being one of the best experiences of your life.